...Blue audi. Black leather interior. 190k miles. Body in good condition. 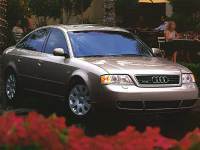 ...1998 Audi A6 6cyl. Not sure if there\'s a title. Runs and drives but starts out in high gear.